Bob Slayer and his BlundaBus. WHEN IS a bus not a bus? When it’s a double-decker comedy venue on wheels! 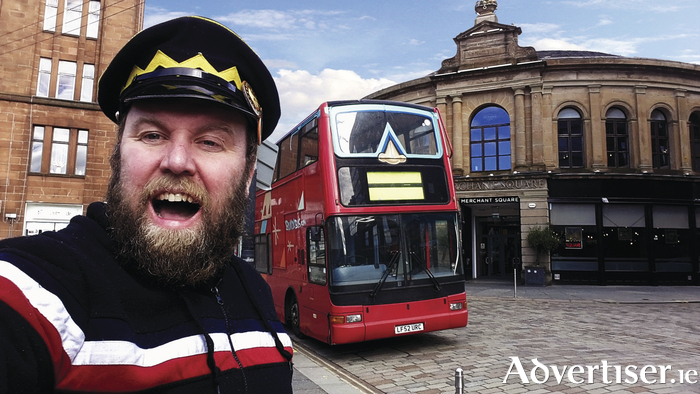 One of the oddest successes of last year’s Vodafone Comedy Carnival returns to Eyre Square this October - Bob’s BlundaBus, a big red converted ex-London bus. Throughout the Comedy Carnival - October 24 to 30 - the BlundaBus, a 45 seat theatre and bar (it also has its own piano ), will host stand up comedy, gameshows, poetry, and children's shows. These will follow the ‘pay what you want’ model pioneered at the Edinburgh Fringe. Audiences enter for free and tip the performer on the way out. Acts appearing at the BlundaBus will be Porky The Poet, the stanza bandying alter ego of Phill Jupitus; heroes of the Roisin Dubh Comedy Clubh like queen of the offbeat Áine Gallagher; Wicklow’s grimmest clown, Liam Nugent; Mayo’s finest if most begrudging joke-writer, Ger Staunton; crown prince of dad jokes Martin Angolo; and human shambles Danny Ryan; along with local legends of the Galway comedy scene, Bob Hennigan and Johnny Graham. The award-winning venue was created by comedian Bob Slayer, a multi-award winning comedian, promoter, and storyteller. A former jockey and band manager, in recent years he masterminded the reading, in its entirety, during the Edinburgh festival, of the Chilcott report, a damming 6,000-page report on the Iraq war, invasion, and occupation. More than 2000 people volunteered to read including Stewart Lee, Ian Rankin, and Reginald D Hunter. Bob Slayer will also perform several shows from “ComedyOpoly” where comedians play board games, through “NeverMind The BusStops”: a madcap late night lock-in with special guests to “How to Drive a Bus” an adventure for all ages, but especially popular with children!